Cintha is a modern calligraphy font with handwritten, sophisticated flows. It is perfect for branding, wedding invites and cards. Cintha includes full set of elegant uppercase and lowercase letters, multilingual symbols, numerals, punctuation and ligatures. 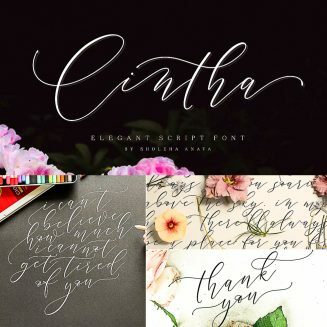 Tags: calligraphy, elegant font, elegant script, feminine font, handwritten, logo font, love font, modern calligraphy, wedding font.